At 1960 Eye Surgeons, we specialize in evaluating patients who have cataracts. Our evaluation will confirm the cataract’s presence in your lens as well as determine how much your sight has been affected. Once your vision begins to be compromised by the clouding of the lens and it is causing difficulty with daily activities, then cataract surgery may be a solution to improve your vision. 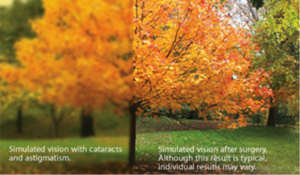 This evaluation will be part of the comprehensive eye exam of patients who have cataracts. Can Cataract Surgery be Performed with a Laser? Yes. Laser-assisted cataract removal can be performed to enhance refractive outcomes. Can I Have Cataract Surgery and Correction for Astigmatism? If you have worn glasses or contact lenses for most of your life you probably have astigmatism. This is a condition affecting the shape of your eye causing you to need corrective lenses to see clearly. The good news is that now you can free yourself from cataracts and astigmatism in cataract operations. During the cataract surgery, your Ophthalmologist replaces your cloudy lens with a new lens known as an intraocular lens (IOL). Because of today’s technology, you can now choose an IOL for cataract treatment and correction for astigmatism giving you the opportunity to enjoy reduced dependency on glasses or contacts. This lens greatly reduces or possibly eliminates need for glasses for distance vision but still requires you to use reading glasses for near correction. With these advanced multifocal lenses, you can correct for cataracts as well as enjoy the benefits of diminished need for reading glasses. Free Yourself From Cataracts and Astigmatism. Give us a call to schedule your appointment at our north Houston offices at 281-890-1784 or contact us online. Cataract Surgery CostsCataract Surgery ProcedureCataract Surgery RecoveryCataract SymptomsWhat Is A Cataract?